TEHRAN, Iran (AP) — Ahead of his inauguration, Iran’s new president on Friday called Israel an “old wound” that should be removed, while tens of thousands of Iranians marched in support of Muslim claims to the holy city of Jerusalem. Hassan Rouhani’s remarks about Israel — which Iran considers to be its archenemy — echoed longstanding views of other Iranian leaders and could tarnish his image in the West as a voice of moderation in Iranian affairs. “Israelis show a compromising face to the world but continue their expansionism in practice,” Rouhani said according to Fars, another semi-official news agency. However, Rouhani’s official website later Friday published somewhat different comments, citing him only as saying that “the occupation of Palestine and Jerusalem … is a wound on the body of the Islamic world,” without any direct reference to Israel or saying that this wound should be removed. Israel’s Prime Minister Benjamin Netanyahu promptly condemned Rouhani’s remarks. The Israeli leader has urged the world to step up pressure on Tehran to halt its disputed nuclear program with tougher sanctions and threats of military action. 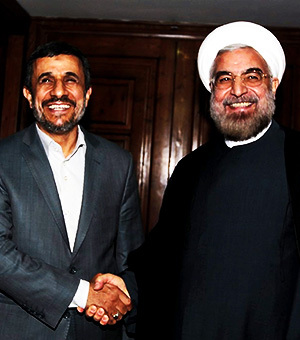 Rouhani won a landslide victory in Iran’s June 14 presidential election and is to officially replace Mahmoud Ahmadinejad on Sunday. Rouhani spoke at an annual pro-Palestinian rally marking “Al-Quds Day” — the Arabic word for Jerusalem — and although his remarks appear contrary to his outreach efforts to the West, they should also be seen in the context of internal Iranian politics where softening the establishment’s anti-Israeli stand is not an option. 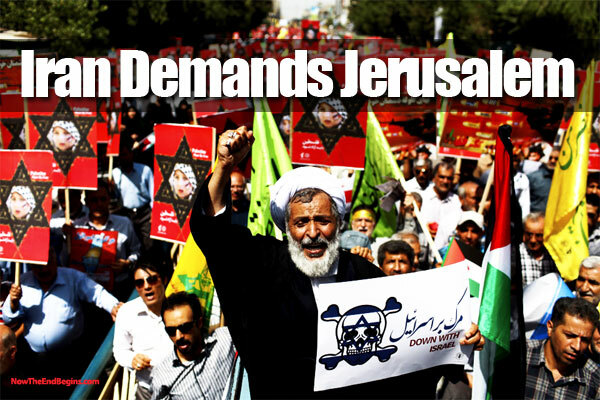 Iran does not recognize Israel and has since the 1979 Islamic Revolution observed the last Friday of the Islamic month of Ramadan as “Al-Quds Day.” Tehran says the occasion is meant to express support for Palestinians and emphasize the importance of Jerusalem for Muslims. Jerusalem’s eastern sector houses sensitive Jewish, Christian and Muslim shrines and is sacred to all three religions. Jerusalem is the holiest place in Judaism and the third holiest city in Islam, after the Saudi Arabian cities of Mecca and Medina. Anti-Israeli rallies were held in cities and towns across Iran. In the capital, Tehran, tens of thousands took to the streets, chanting “Down with America” and “Death to Israel.” Some protesters also burned American and Israeli flags. Outgoing President Ahmadinejad – who was known for vitriolic anti-Israeli rhetoric while in office, including calls that Israel be destroyed – spoke to the crowds after Friday prayers at the Tehran University campus in his last public speech before his term ends.